Emerson, George D. (Compiled by) (1912). The Perry's Victory Centenary - Report of The Perry's Victory Centennial Commission, State of New York. Albany: J. B. Lyon Company. アルフレッド・セイヤー・マハン Sea Power in Its Relations to the War of 1812 . 1905. Miller, Arthur P. Jr.; Miller, Marjorie L. (2000). Pennsylvania Battlefields and Military Landmarks. Mechanicsburg, PA: Stackpole Books. ISBN 0-8117-2876-5. Skaggs, David; Atloff, Gerard (1997). 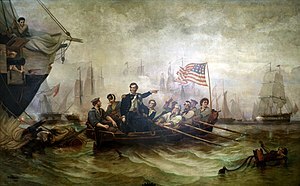 A Signal Victory: The Lake Erie Campaign, 1812-13. Naval Institute Press. ISBN 1-5575-0892-5. Symonds, Craig (2005). Decision at Sea. Oxford University Press. ISBN 0-1951-7145-4.